With all the planning that’s involved in the months leading up to your dream wedding, it’s easy to forget that with the exchange of the vows comes a whole new set of challenges. With this list, put the finishing touches on that perfect celebration. 1. Assemble a crew of family and friends beforehand, and divvy up those post-wedding tasks among them. Jobs might include tidying up the venue, boxing up extra food and drinks, delivering tips to vendors, gathering tuxedos from out-of-town groomsmen and other rental items to be returned, and transporting wedding gifts from the venue to your home. You might even want to assign someone the job of making sure that the bride and groom’s luggage makes it to the getaway car. Don’t be afraid to put your friends and family to work! 2. Jump on gift returns as soon as possible! It’s not uncommon to receive duplicates, and you’ll want to make returns or exchanges before store deadlines (usually 30 or 60 days). But heads up: Many of your gifts won’t come with receipts, so you might have to settle for store credit. 3. Try an after-wedding photo session. Aside from giving the couple more time and photo shoot locations, an after-wedding shoot is much less stressful and can bring a nice variety to your wedding photos (plus, you don’t have to worry about getting the dress dirty). 4. Don’t let that beautiful cake go to waste! Ask the catering staff to box up the top tier, and assign a trustworthy family member to take it home and prepare it for freezer storage. If done right, you can celebrate your one-year anniversary with a delicious slice of nostalgia. Here’s our bride-tested secret for how to store your cake: Seal the layer in a generous casing of plastic wrap, then aluminum foil, then more plastic wrap. Finally, place the cake in a box or tin to protect it from bumps in the freezer. 5. Whether you plan to hire out a professional to preserve your entire bouquet or keep a few blooms to press for yourself, ask a member of the catering staff if it can be stored in a refrigerator during the reception. 6. You’ll definitely want to get that perfect gown professionally cleaned after the wedding, but it might be a few days before you’re able to drop it off. During that time, keep it stored in safe, dark place, rolled or folded up in a white sheet. 7. When it comes to changing your name after the wedding, the sooner the better. Set aside time to research this process because a name change will also require you to update your social security card, your driver’s license and your bank accounts (in that order). 8. 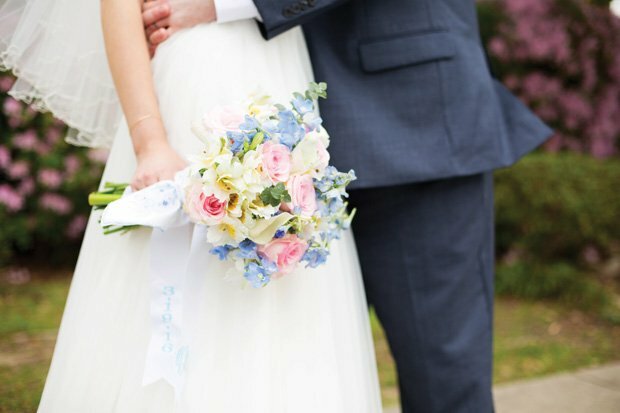 If you’re paying for a wedding website, don’t forget to take it down after the celebration! As for your registry, it’s common to leave it online for a few months after the “I Dos” (since etiquette gives guests a year to deliver their gifts), but when it becomes clear that it’s no longer necessary, go ahead and pull the plug. 9. Finally, plan something else! However small the occasion, keeping yourself busy by planning a get-together will help you get over that inevitable post-wedding slump. And don’t forget to pat yourself on the back for a wedding well planned!